Pictured (l-r): Tish Cyrus, Brandi Cyrus (Evans Vestal Ward / NBCUniversal). Are you ready spiff things up this spring? The new Cyrus vs. Cyrus: Design and Conquer TV show premieres on Bravo, Thursday, May 25, 2017 at 10:00pm ET/PT. 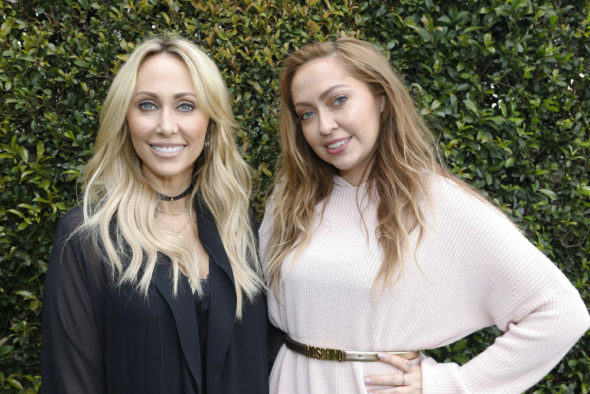 The Nashville-set luxury home makeover show features the mother-daughter duo of Tish Cyrus and Brandi Cyrus. Tish and Brandi executive produce Cyrus vs. Cyrus: Design and Conquer with Steve Michaels and Jonathan Koch. Expect appearances from Billy Ray Cyrus, Miley Cyrus, Noah Cyrus, and Trace Cyrus. Check out this sneak peak from Bravo. NEW YORK – March 20, 2017 – Grab your boots and blueprints! Bravo Media heads to Nashville for a charming new series, “Cyrus vs. Cyrus: Design and Conquer,” featuring Tish and Brandi Cyrus premiering Thursday, May 25 at 10pm ET/PT. This mother-daughter design duo embarks on a new adventure making over luxurious homes in need of a face lift, with special appearances by other members of the Cyrus clan including Billy Ray, Miley, Noah, Trace and Braison. “Cyrus vs. Cyrus: Design and Conquer” is produced by Asylum Entertainment in association with Hope Town Entertainment with Steve Michaels, Jonathan Koch and Tish Cyrus serving as Executive Producers. Pictured (l-r): Tish and Billy Ray Cyrus (Anna Webber / Bravo). What do you think? How do you like the sound of the Cyrus vs. Cyrus: Design and Conquer TV show? Do you plan to check out the Bravo TV series premiere? More about: Bravo TV shows: canceled or renewed?, Cyrus vs. Cyrus: Design and Conquer, Cyrus vs. Cyrus: Design and Conquer: canceled or renewed? Odd Mom Out: Cancelled or Renewed for Season Four on Bravo?